Im all for trying new foods.. I have only ever used Gnocchi twice before and quite honestly one dish was lovely Garlic, Mushroom, Ham and Pesto Gnocchi the other was a disaster! 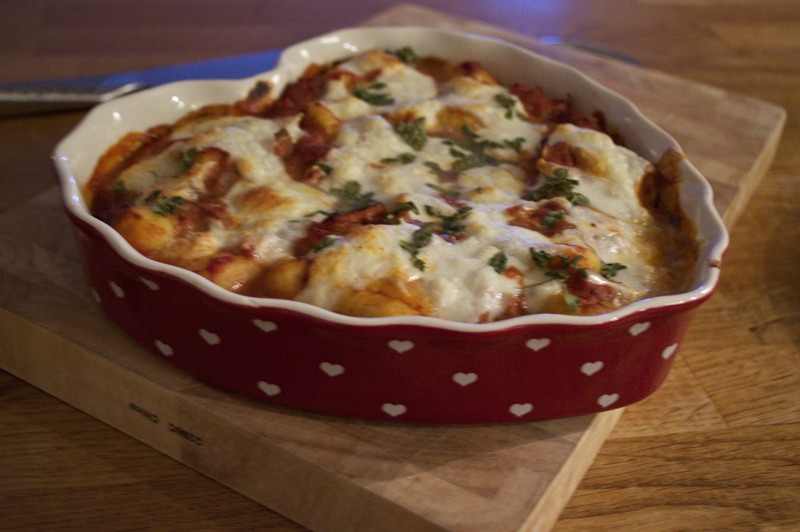 If you have ever had badly cooked gnocchi its enough to put you off for life – trust me! 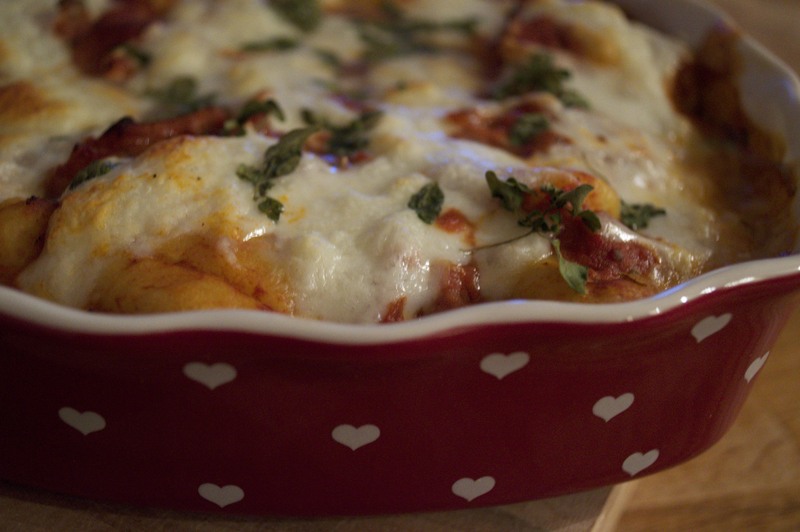 Still on my mission to try new foods, I thought I would re-try a Baked Gnocchi recipe with an open mind and it was gorgeous! Even my husband who groaned with disappointment and made sure I had a backup when I said we were having it, loved it! I served it with a grilled chicken breast and green salad – Yum! 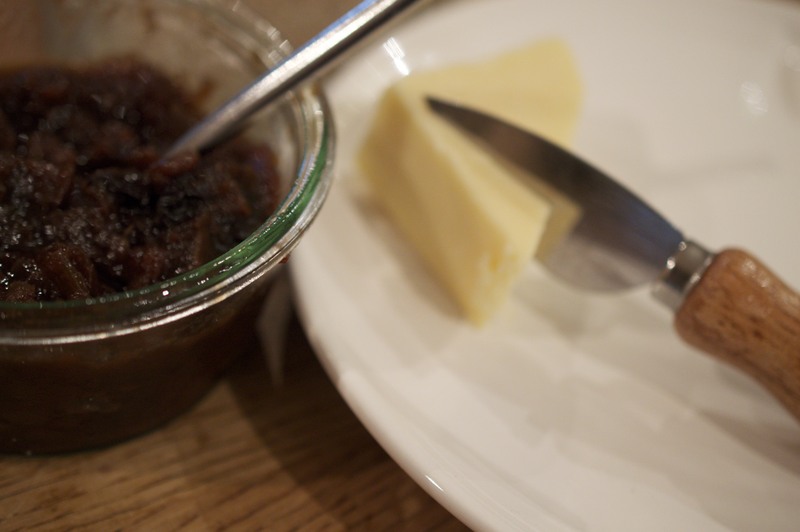 Really easy slow chutney! A great recipe if you love making chutneys or a beginner etc but do not have the time to stand over a boiling pan! This recipe which can be put together the night before, and then just before you leave for work place the lid on and leave to beautifully infuse gently caramelising as it cooks! The choice is yours over timing – options are endless and it seems to be quite forgiving! 6 hours or 6 on high plus 10 hours on medium/low or for super slow stick it on medium for 12 -18 hrs stirring occasionally until it is the right consistency! Amazing Baked Polenta – Really!! Ok so I realise the first thought from most of you will be “Urgh! Polenta gross! !” completely understandable when you have had it served in a great plain lump or just cooked and salted! So I have quite a challenge ahead to convince most of you of how incredibly nice this recipe and ingredient really is. My mission recently has been to try out new ingredients – be more experimental and not fall into the habit eating the same old recipes week in week out. This includes using ingredients which have dodgy reputations! 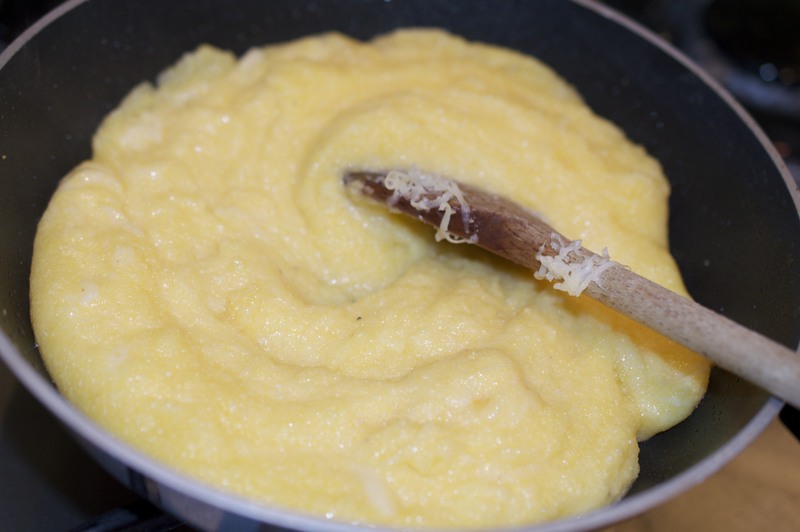 So having been tempted to buy polenta in the supermarket as it sat there alone next to the couscous, (which is what I was really there for) with no recipe in hand I thought – there must be a recipe in which can use whatever ingredients I have lying around! Whilst having coffee with an unconvinced neighbour and I googled polenta and found this recipe by Stylist.co.uk. Knowing that this could be either a success or failure, at least I was safe in knowledge that if it was awful I could always pop over there for some chicken enchiladas!! The end result was that good I even took a small ramekin round to my neighbour and she devoured it in seconds – now that says something!! 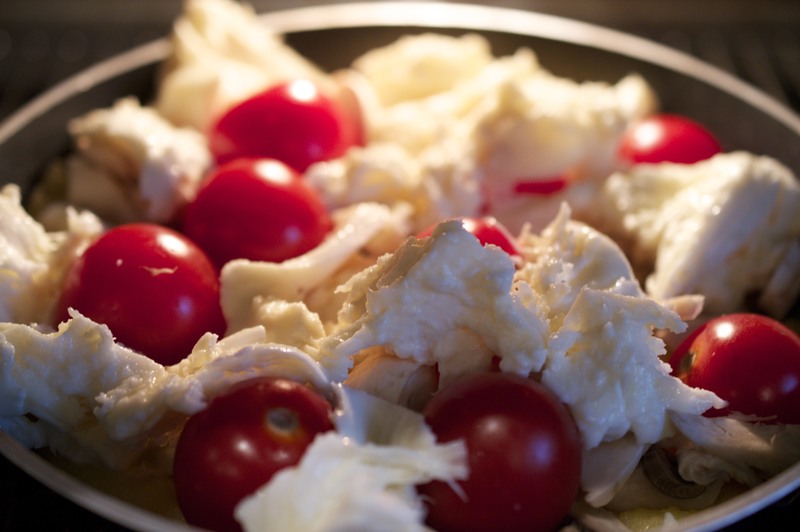 Original recipe: Polenta Bake With Feta, Tomato and Mushrooms mine is a variation on the original recipe which claims to be a total of 250 calories per serving!! Talk about healthy! Pre heat the grill to high. 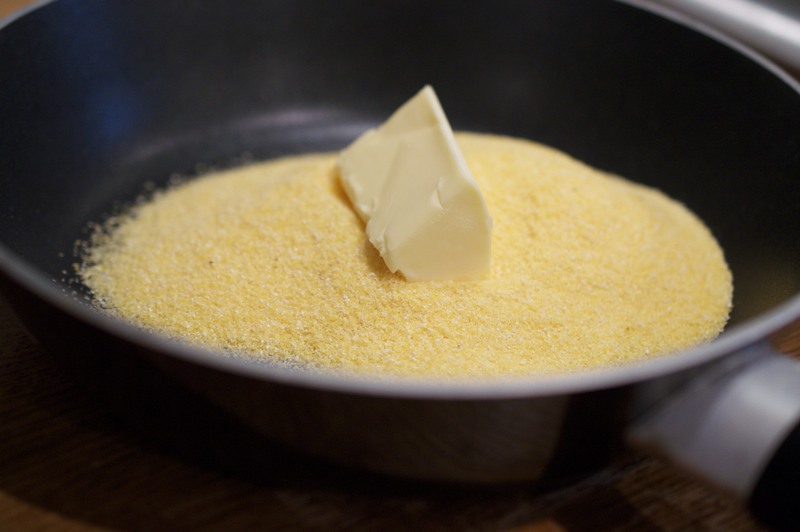 Prepare 750ml of hot stock, then place the butter polenta and stock into an oven proof frying pan over a medium heat stiring quickly to prevent any lumps. Once bubbling remove from the heat and mix in the cheddar. 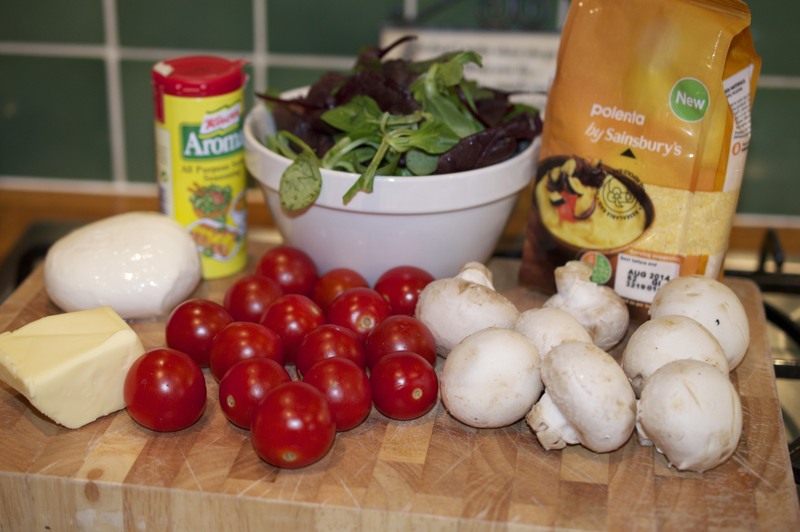 Scatter the mushrooms followed by the tomatoes then tear the mozzarella on top. Place the pan under the hot grill for 10 to 12 mins. 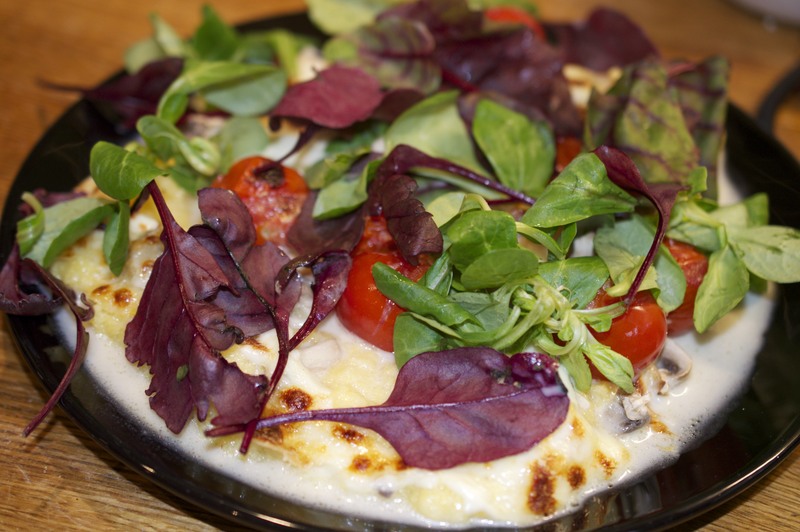 Remove from the grill and serve scattered with baby salad leaves – Most of all enjoy!! 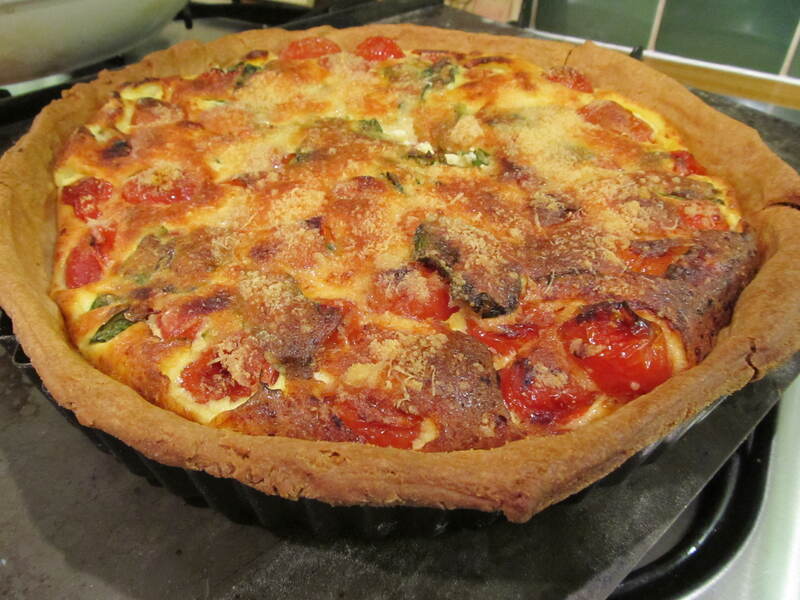 This has to be one of favourite quiches – its so easy and sooo tasty! So much so my husband ate well over half for his dinner!! I think it may be unwise to make another tomorrow just to save his waist line!! Kidding..his waist line’s fine – I tell you mine certainly wouldn’t be if I did that – lucky devil!! Pre-heat your oven to 180 200 fan. 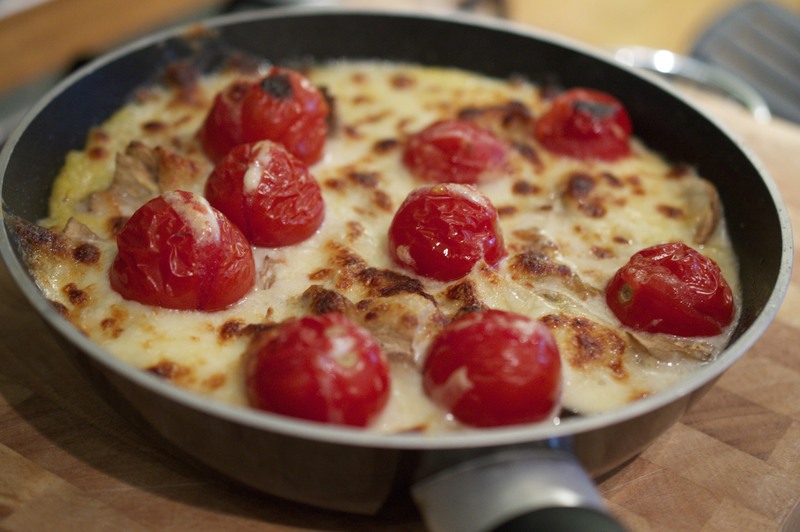 Place the tomatoes into a baking tray with the olive oil into the bottom of the oven. 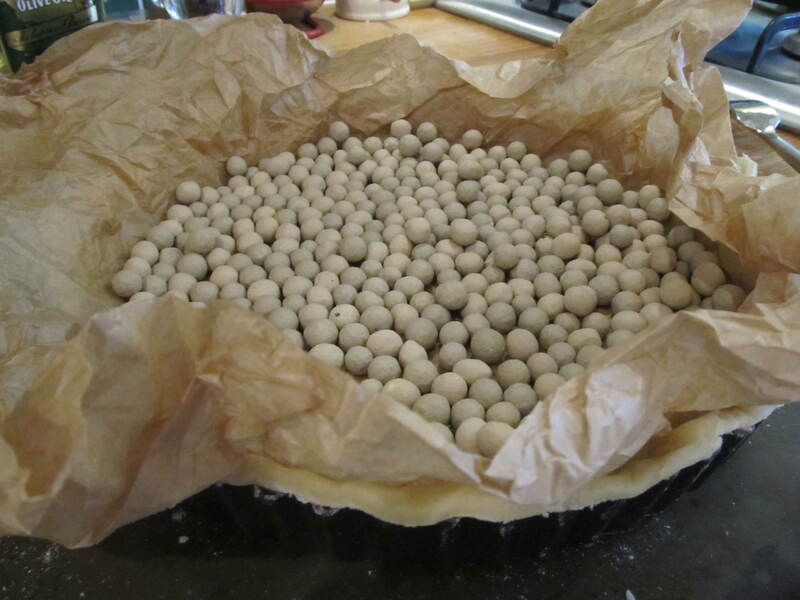 Roll out the pastry onto a floured surface to the thickness of a pound coin. 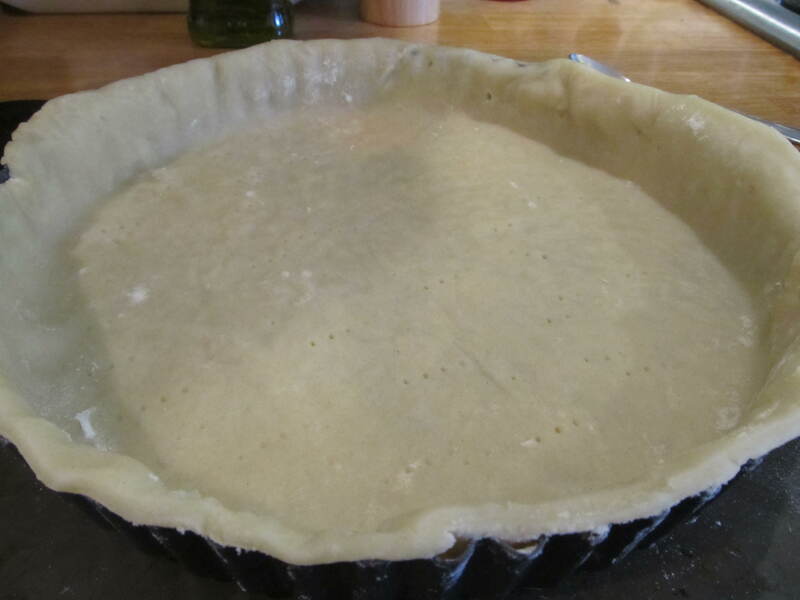 Line a large loose bottomed flan case with the pastry – lightly prick all over with a fork. Line with baking paper filled with baking beans then cook in the oven for 20 mins. Remove the paper and beans then return to the oven for 5-10 mins until golden. 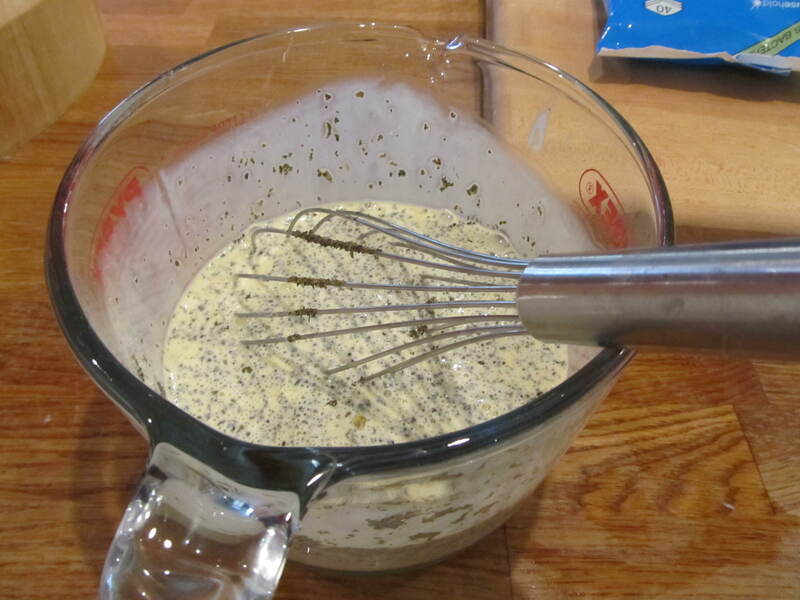 Whisk the eggs in bowl then pour in the cream and basil and mix until combined. 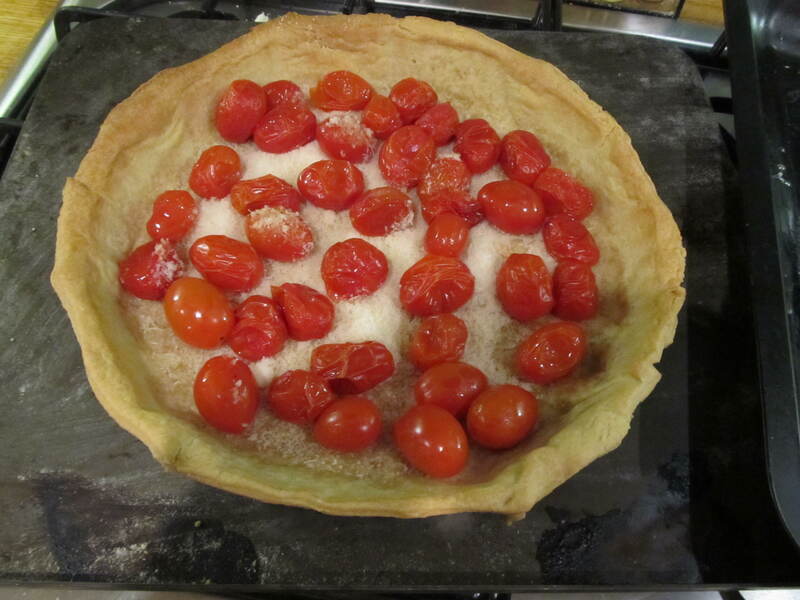 Remove the tomatoes from the oven and scatter these across the base of the flan case followed by half of the cheese. 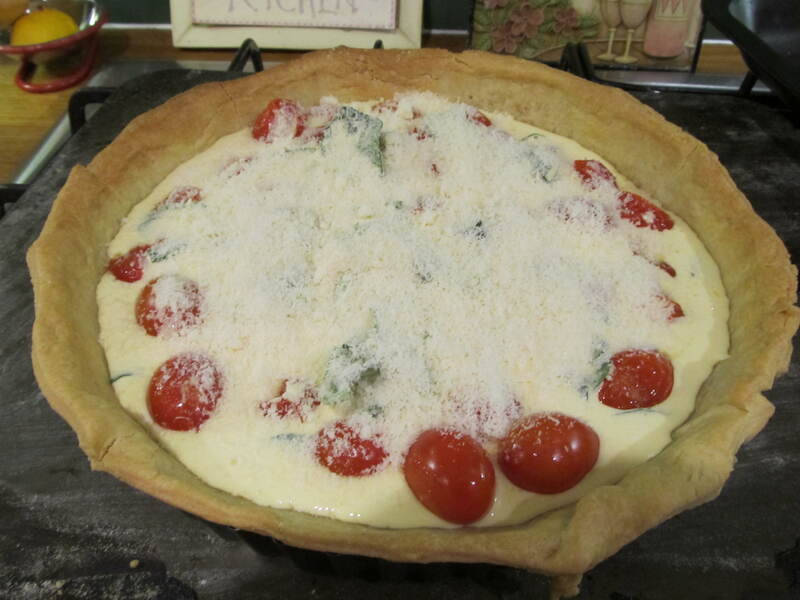 Pour the egg mixture on top followed by scattering the basil leaves and cheese. 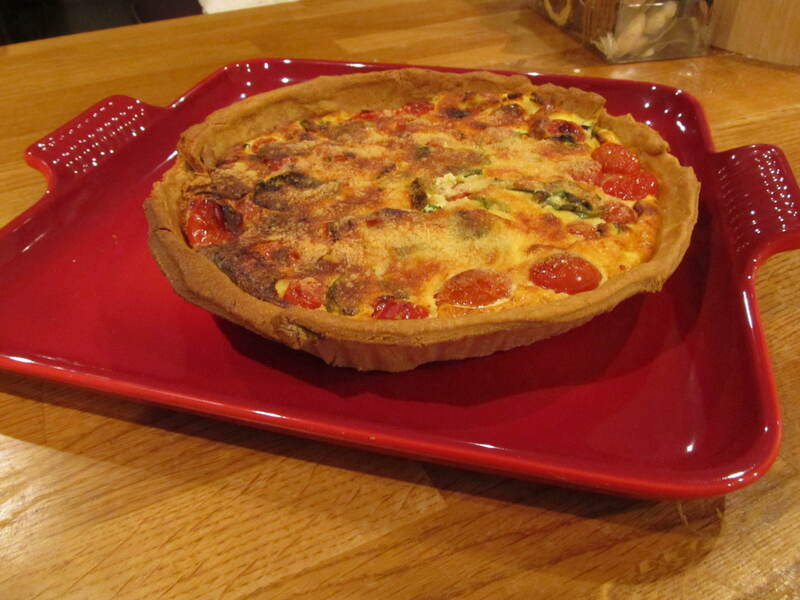 Place in the oven for 20 -25 mins until golden and set – serve warm with fresh salad leaves yum!